It makes sense for any international company to maximize its performance by tapping into the largest talent pool available. Yet according to a recent report, while most do have Global Mobility Programs in place, many are falling short due to a failure to understand how inclusion and diversity impact global mobility programs. The report, Inclusion and Diversity: How Global Mobility Can Help Move the Needle from KPMG International, questioned 181 professionals to get their views on how inclusion and diversity impatc global mobility and recruitment programs. Let’s take a look at why inclusion and diversity have a big impact on global mobility and, more importantly, what can be done to boost I&D programs’ influence in attracting and retaining top talent. As the below graphic from the study indicates, a majority of global mobility professionals surveyed reported they don’t have inclusion and diversity goals as part of their overall global mobility strategy. The fact that business units most often select candidates for international assignments, with global mobility having more of an operational function, is cited as one reason this happens. In fact, many respondents said inclusion and diversity goals could be “counterproductive and unattainable,” with some seeing movement of workers across international boundaries as fulfilling I&D requirements by its very nature. The four in ten survey respondents who reported including inclusion and diversity goals in their overall global mobility strategies, however, see the situation in a very different way. 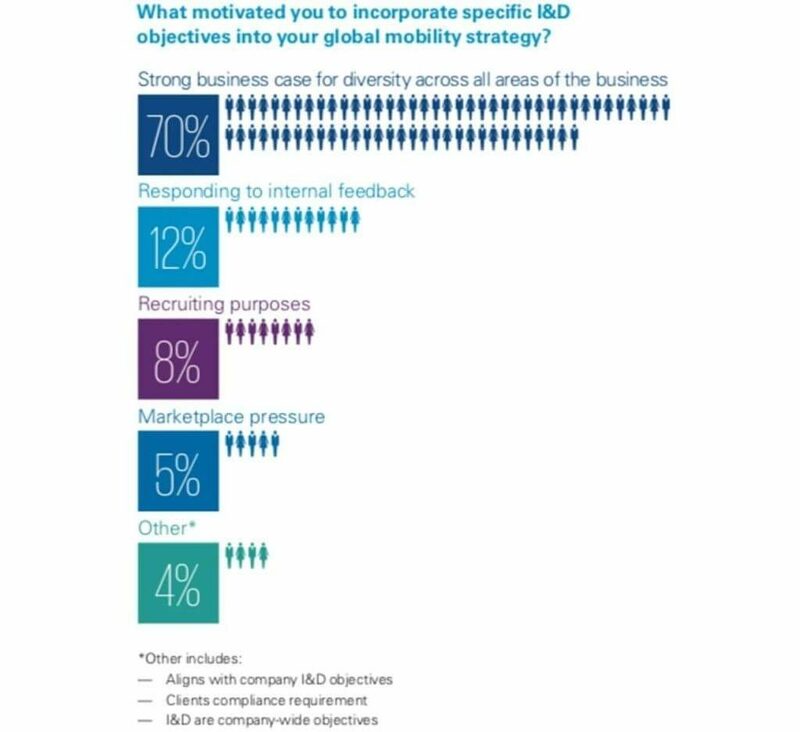 Rather than seeing I&D as something they are forced into by pressure from either company policy or the marketplace in general, a large majority see a strong business case for the addition of I&D goals and objectives. As previously mentioned, their role is often seen as being operational, rather than being involved in recruitment decisions. A lack of diversity amongst the pool of candidates, for example with traditionally male-dominated roles not attracting female applicants. External barriers such as differing attitudes to LGBTQ issues in different countries or restrictive immigration policies. An absence of data analysis, other than for gender, hampers the identification of patterns and potential problem areas. This last factor can lead to misplaced priorities. For example, the majority of respondents said gender, socio-economic, and ethnic policies were priorities. As the below graphic from the report indicates, sexual orientation may require greater attention, with that being given as the most common reason for adverse mobility decisions. Although admitting corporate global mobility programs can’t “change the world,” the study and its findings does provide some pointers as to how a better understanding of their organization’s inclusion and diversity issues can help have an impact. Here are some things to consider when thinking about how inclusion and diversity impact global mobility. If you’d like a deeper dive on this topic, my partner, Daniel Newman, covered this in his post over on our Converge media site: Using the Power of People Analytics to Transform the Future of HR. Increase flexibility when learning how inclusion and diversity impact global mobility. Flexibility matters when it comes to enhancing your global mobility programs. For instance, consider offering alternative arrangements, such as short-term transfers and assisted commuting. These kind of flexible work options can help make assignments more attractive to staffers and help potential assignees avoid family disruption. Tailor policy selection. It’s fair to say that in just about every instance, global mobility programs would be best served by integrating a smarter use of data into the processes. Data analysis can help companies better identify potential candidates at the right stage of their career and shorten the time frame to find, hire, and/or deploy the right talent into the right positions. Better communication. There is pretty much no instance where better communication doesn’t deliver better results, and the same is true as it relates to global mobility programs and an effort to focus more on inclusion and diversity. The better your internal comms, the better you’ll be able to address and overcome concerns and misconceptions and get your mobility program operating at full speed. Leadership Training Pays Off. Don’t assume that your staff inherently knows how to lead, especially when it comes to areas like diversity and inclusion. Make sure you invest in leadership training across the the entire organization, which will help increase awareness and understanding of the importance of these issues, as well as support and help steer corporate culture in the right direction moving forward. Align business goals. As with all business units, focusing on strategic alignment pays off. When companies allow global mobility to become more than an operational function and instead a strategic partner with other business units, you’ll find the needs of everyone involved better served. 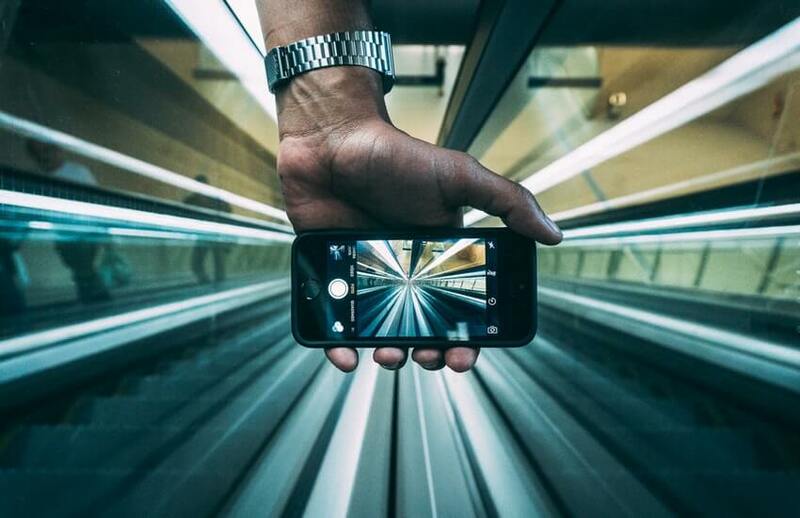 Think of it this way: Your corporate mobility team is in the people business. You need the right people in the right positions at the right time to achieve your business objectives. The most effective and expeditious way to make that happen is to align your corporate mobility team with your business units and work together strategically to meet your mutual goals. Technology plays a role here, especially as it relates to collaboration and connectivity within your team. Collaboration platforms can enhance team connectivity and have a big impact on productivity. Our team is virtual and spread out all across the United States. We’ve used Cisco’s Webex as well as the Microsoft Teams collaboration platforms with great success. When your team can see one another, collaborate virtually at the push of a button, share thoughts, content, record meetings or interviews, conduct video interviews, etc., it can make a world of difference in how effective your global mobility efforts are and how inclusion and diversity impact global mobility. This interesting report highlights just how important inclusion and diversity issues are to global mobility aspirations; and how many organizations are falling short in achieving the desired level of impact. You can find the full report at: Inclusion and Diversity: How Global Mobility Can Help Move the Needle. You might also find this accompanying infographic helpful in providing background information. How does inclusion and diversity factor into your global mobility operations? Do you experience some of the issues and challenges highlighted in the KPMG report? Have you faced other challenges not mentioned here? If so, I’d love to hear your thoughts on how inclusion and diversity impact global mobility.